UKROBORONPROM State Enterprise "Kharkiv Morozov Machine-Building Design Bureau", is working to create next-generation combat vehicles that are to enter into service of the Ukrainian Army in 2020. 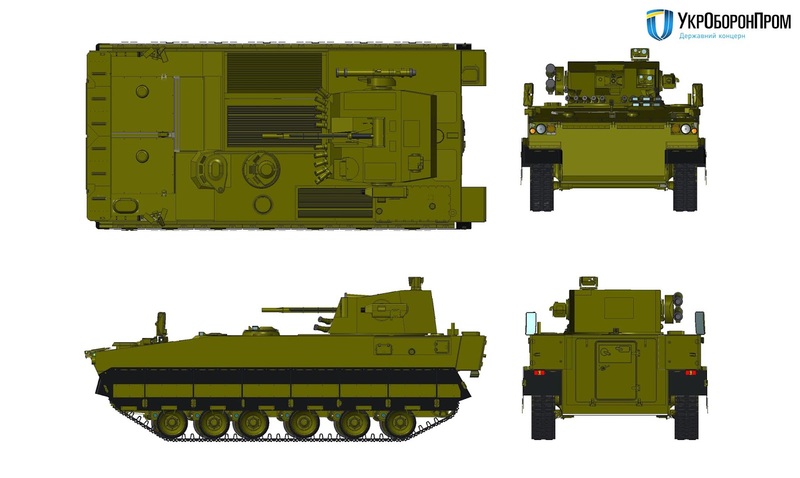 The designers and engineers of the SE "Kharkiv Morozov Machine-Building Design Bureau" are now focusing on the creation of BMP-U, a new IFV, which is to replace BMP-1 and BMP-2. Kharkiv Morozov Design Bureau has already developed design documentation, manufacture of the prototype and testing will take place in 2019. BMP-U is intended for transportation and fire support of ground forces. It provides reliable protection for the crew of 3 members and 7 paratroopers. According to calculations, the level of BMP-U protection is 10-12% higher than of BTR-4. In addition, the engine transmission compartment is located in the front of the vehicle, which guarantees a greater level of crew protection. In order to provide high maneuverability and speed on the battlefield, BMP-U will be equipped with a 735 hp diesel engine and automatic transmission. Given the mass of a new infantry combat vehicle of 25-27 tons, BMP-U specific power is at the level of 27-29 hp/t. This figure is significantly higher than the specific capacity of BMP-1 (21-23 hp/t.) and modern main battle tanks. In addition, the BMP-U will overcome water obstacles. The BMP-U will be armed with a new combat module BM-8 with improved characteristics. It is equipped with a 30-mm automatic gun, automatic grenade launcher, machine gun, as well as guided anti-tank missiles "Barrier". BMP-U has modular design, with the possibility of using the base platform for a whole family of tracked vehicles. Thus, command vehicle, command and staff vehicle, reconnaissance, medical, repair and evacuation and other types of vehicles will be created on the basis of BMP-U. The SE "Kharkiv Morozov Machine-Building Design Bureau" is working to create a promising next-generation tank. Comprehensive work – designing of an entirely new vehicle – is divided into separate stages: creation of a motor-transmission unit, the development of new weapons systems, ammunition, fire protection and control systems, as well as the automation of most processes to reduce the number of crew members from three to two. These works are planned for several years, including implementation of all key points of the program. As of today, the Kharkiv Morozov Design Bureau team has carried out a preliminary development of the engine transmission compartment and the calculation of the main engine parameters, as well as works on manufacturing of transmission prototypes. The new engine should receive power 1500 hp, the ability to work on different types of fuels and their mixtures and the ability to operate at critical temperature and climatic conditions. It has to have compact dimensions, modular construction and to be operated using rear-wheel drive, as well as front-wheel drive layouts. Due to this, the engine can also be used to create new samples of heavy tracked vehicles.